Center for Political Education | People Get Ready II is Back On! 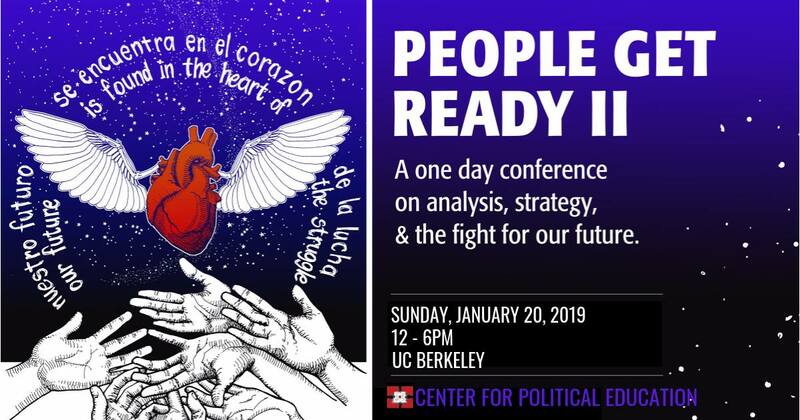 Center for Political Education is excited to announce that we have rescheduled the People Get Ready 2 conference for January 20–same place, same time, same powerful opportunity to seize the time and push our movements forward! People Get Ready 2, a one day conference organized by Center for Political Education, will offer discussions directly assessing the current political terrain while engaging local, national, and international struggles around militarism, worker-organizing, and displacement that shape our world and struggles to come. We are excited to welcome back most of our speakers and panelists and will drop a detailed program ASAP. In the meantime, please save the date and help us spread the word about People Get Ready 2. And if you haven’t already pre-registered, you can do so by clicking here.